Mol. Cells. Mar 31, 2019; 42(3): 262-269. The recombinant plasmid pET30a-P22 lysozyme-PMAP36 was transformed in E. coli BL21 (DE3) for fusion protein expression. For large-scale expression, we inoculated a single colony into 100 mL Luria-Bertani (LB) broth containing 50 μg/ml kanamycin and incubated at 37°C and 200 rpm for overnight. Next, 10 ml of seed culture was transferred to 1 L LB broth containing 50 μg/ml kanamycin in a baffled flask; the culture was grown at 37°C and 200 rpm until OD600 was 0.6. We induced the recombinant protein expression by adding 0.5 mM isopropyl-b-D-thiogalactopyranoside (IPTG) and incubated the cells for 24 h at 28°C and 170 rpm. The cultured cells were harvested by high-speed centrifugation at 1400 × g for 15 min at 4°C. On the other hand, we investigated the growth behavior of E. coli, including the PMAP-P22 lysozyme fusion protein plasmid, during the expression culture ( Supplementary method). We determined the minimal inhibitory concentration (MIC) of the fusion protein, as described previously (Lv et al., 2014), using Staphylococcus aureus, S. enterica serovar Typhimurium, Pseudomonas aeruginosa, and Bacillus subtilis. Next, overnight cultured microbes were diluted to 1 × 105 CFU/ml, mixed with P22 lysozyme, PMAP36 peptide, and PMAP36-P22 lysozyme fusion protein (final concentration: 0.125–128 μM), and incubated at 37°C for 24 h. Then, 10 μl mixture was dropped on Mueller–Hinton (MH) agar plate and incubated at 37°C for 18 h. The MIC results were interpreted by colony formation. In addition, we used four different antibiotics as references (final concentration: 0.125–128 μg/ml) to check the antibiotics sensitivity as described above ( Supplementary Table 2). The construct of recombinant plasmid encoded PMAP36-P22 lysozyme fusion protein. Occasionally, proteins with antimicrobial activity could account for inhibiting bacterial growth during expression. We used two different bacteria, E. coli including vehicle (negative control) and E. coli transformed by recombinant plasmid pET30a-P22 lysozyme-PMAP36 (PMAP36-P22 lysozyme fusion protein) in cell growth and expression to investigate the inhibitory effect of the growth of E. coli including the PMAP36-P22 lysozyme fusion protein. 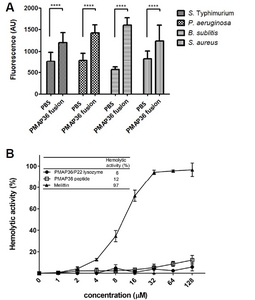 Compared with the negative control, the cell growth of the PMAP36-P22 lysozyme fusion protein-expressed E. coli exhibited no significant difference ( Supplementary Fig. 1), suggesting that the PMAP36-P22 lysozyme fusion protein has no inhibitory effect on the cell growth. Mol. Cells.Mar 31, 2019; 42(3): 262-269. Received September 1, 2018; Accepted January 27, 2019. Expression and purification of PMAP36-P22 lysozyme fusion protein. (A) The expression of fusion protein was detected using 15% SDS-PAGE gel. 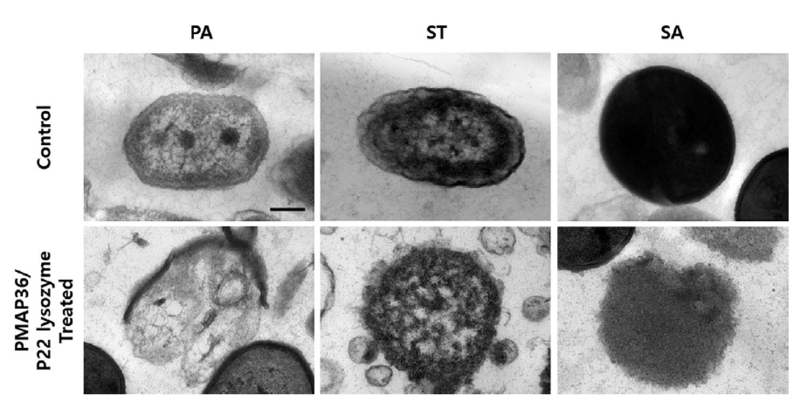 The fusion protein overexpression was induced by 0.5 mM IPTG at 28°C for 24 h in E. coli BL21 (DE3). The PMAP36-P22 lysozyme fusion protein band was shown at a little lower than 20 kDa. (M: size marker, lane 1: whole lysate before induction, lane 2: whole lysate after induction) (B) The chromatogram during the purification of PMAP36-P22 lysozyme fusion protein using the ÄKTA Prime FPLC system and Histrap FF column. (Inset: The eluted fractions were confirmed with 15% SDS-PAGE) (C) The finally purified and concentrated PMAP36-P22 lysozyme fusion protein was confirmed by 15% SDS-PAGE (lane 1) and western blotting (lane 2). 2.5 μg of protein was loaded in the well. Secondary structure CD spectra of the P22 lysozyme (straight line), PMAP36-P22 lysozyme fusion protein (dash) and PMAP36 peptide (dot) in PBS (A) and 1% SDS (B). The concentration of all proteins and peptide were 0.5 mg/ml. Antimicrobial activities. (A) Outer membrane permeability of 4 kinds of microbe (2 Gram-negative and 2 Gram-positive bacteria) was measured using PMAP36-P22 lysozyme fusion protein by EtBr influx assay. The activities were compared with PBS buffer as a control. The error bars show the standard deviation of the mean from three independent trials. Asterisks indicate statistically significant differences between groups. 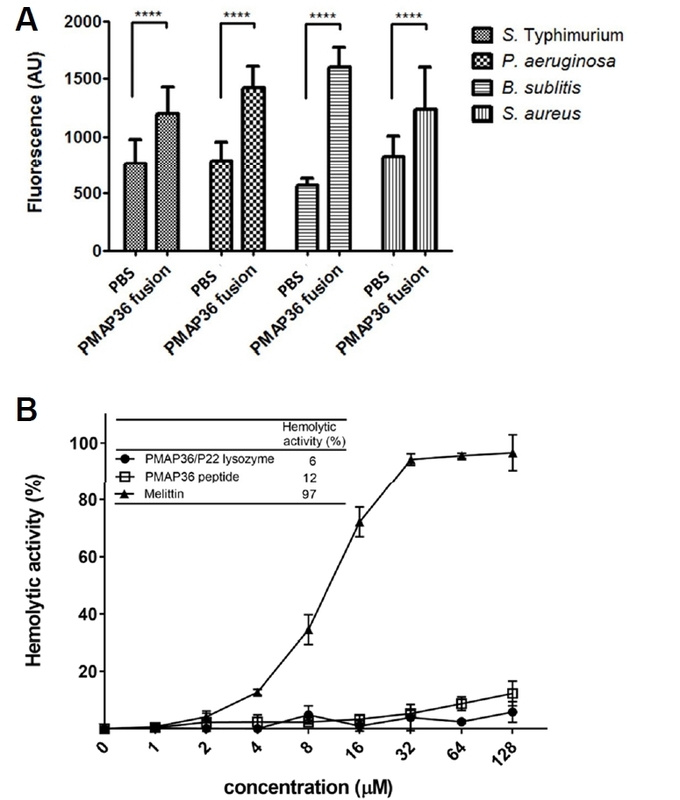 (****, Unpaired t-test, P < 0.0001) (B) Concentration dependent hemolytic activities of PMAP36-P22 lysozyme fusion protein and PMAP36 peptide. After treatment of proteins against pig erythrocytes, the absorbance of releasing hemoglobin was measured at 570 nm. Data were calculated from three independent trials. (Inset: The relative hemolytic activity of PMAP36-P22 lysozyme fusion protein, PMAP36 peptide and melittin at the highest concentration (128 μM)). The immunogenic effects of PAMP36 fusion protein and P22 lysozyme in DCs. DCs were treated with PAMP36 (10 μg/ml), P22 (10 μg/ml) or LPS (50 ng/ml) and incubated overnight. The supernatants were collected and the levels of TNF-α, IL-1β, IL-6, IL-10 and IL-12p70 were measured by ELISA. Data are presented as means ± SEM. *P < 0.05; **P < 0.01; and ***P < 0.001 compared to Vehicle.